I have seen the same thing testing batteries at higher currents. The warmer the battery the better it will perform. If you run a capacity test on the same cell twice and don’t give the cell a rest after the first test after charging the cell, It’s warm from the test and charge. It will tend to have better performance on the second test with usually less voltage sag and higher current. I have noticed it most with the smaller cell sizes. In all type of cells, being based on a specific chemistry, benefit from higher temperatures in terms on internal resistance along with capacity because of the faster ion movement permitted by higher temps. Although in terms of current provided, it obviously has its limit because of electrical conductivity dropping with temperature. So don’t push it say above 40-45C, except for high discharge cells, for good cycle life obviously. 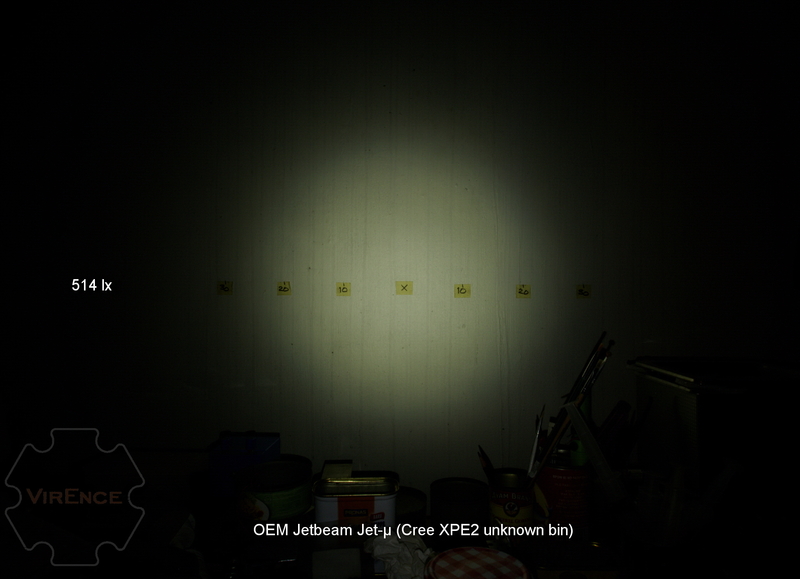 I will post the beamshot with alternate optics later. Those look good to me. Very reasonable compromise in output for the significant improvement in CRI. Since the 5000K Optisolis uses a 420nm diode, compared to the more conventional 440nm diode in the warmer Optisolis variants, with a consequently higher forward voltage, I’m guessing the warmer versions will consequently run a little bit longer at the same current. When will they be available to order? Do you have any 5° TIRs, by any chance? Only up to 10°. At very close range this 10° with its rectangular tight spill already creates some artifacts, the 5° will be worse I guess. The narrow spill is very useful in cases such as mouth or nostril inspection where you don’t want too much glare to the patient. I myself prefer the 20°. The stock optic has bad yellow tint shift ring around the hot spot. 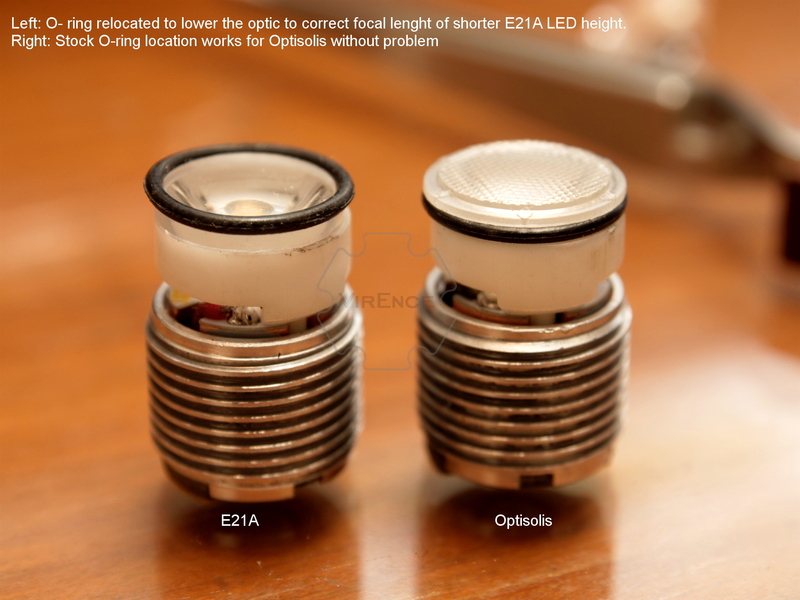 What are the CRI and CCTs of these E21A and Optisolis emitters? 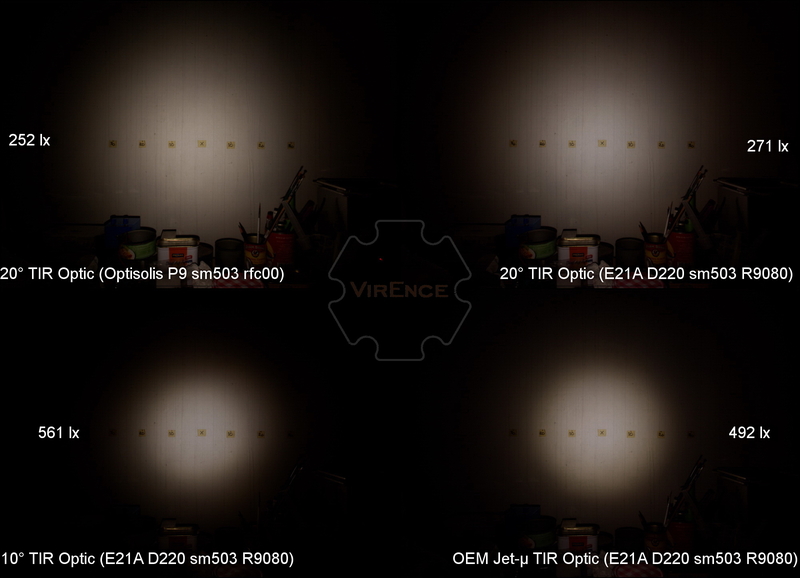 R9080 minimum for the E21A and way higher for the Optisolis. 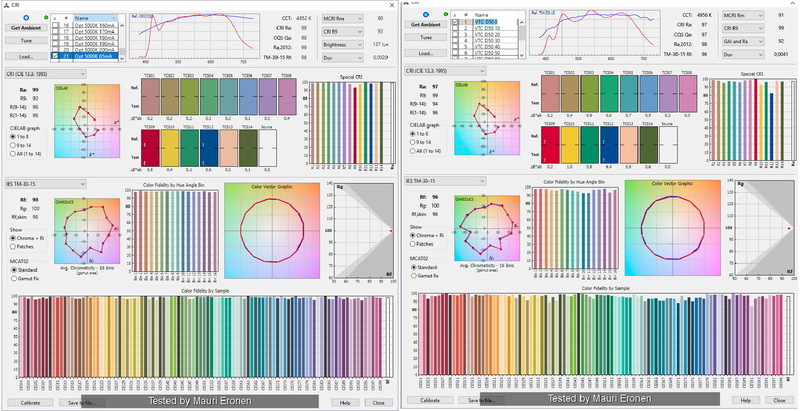 Judging by Maukka’s test results, its currently the highest CRI LED available today. 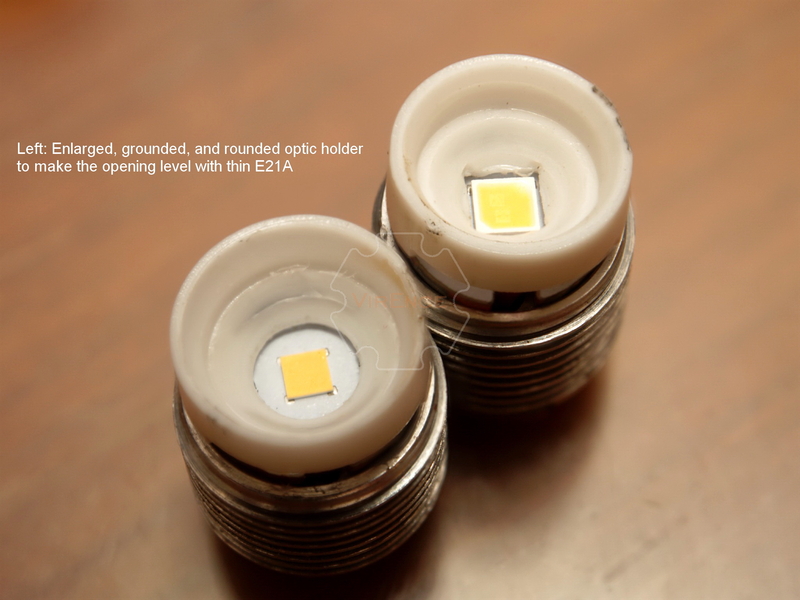 Even better than Yuji D50 LEDs?? 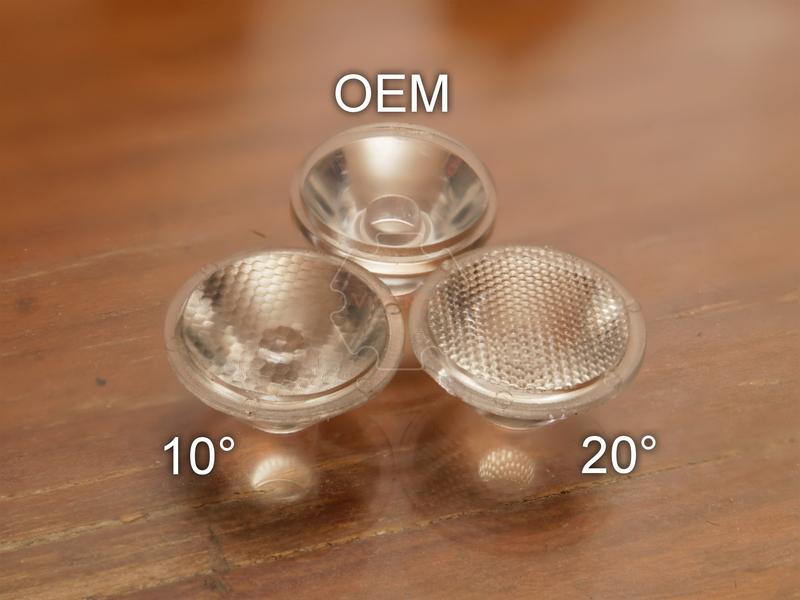 The reflector is H units high, so you can fix an aspheric lens H units above the LED to “zoom” it somewhat. So will these actually be sold? Looks very interesting. Yes they are. Supposed to start the production yesterday but I’m still sick right now. Damn Indonesia to Finland to US. Wonder if I will get it before the end of 2019. Of course if you don’t need the data, just order from Clemence when he makes them publicly available in his store. No reason to include an extra step in that case. Any chance of buying a couple of those 20° TIR optics from you? It’s pretty hard to find something decent in that size via the normal pleb channels..
Or maybe you got them from Yajimei? You might want to wait for the 30°optics next week, currently only few left. The vendor sent me wrong optics earlier. Yeah, 30° is usually the best for a TIR (i.m.o.). So we keep ckecking Virence for the release of these?